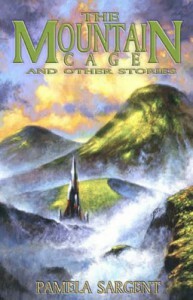 The Mountain Cage and Other Stories, Pamela Sargent, Meisha Merlin Publishing, 2002, ISBN 9781892065629, 348pp. First, a disclaimer: I’ve known Pam Sargent for over ten years, and even maintain her web site for her. I consider her a friend as well as a talented writer. That doesn’t mean that I would automatically write a positive review of her new book if I didn’t mean it. One of the things you learn as a book reviewer who also has a fair number of authors as friends is that adage from your mother about not saying anything if you can’t say something nice. But I’m happy to be genuinely able to say more than a few things nice about this new collection of Pam’s stories, as it truly demonstrates that she is at home in the shorter medium as she is at the novel. Most people are only familiar with her pair of skillfully done political satires, the Nebula award-winning “Danny Goes to Mars” and its thematic sequel “Hillary Orbits Venus” (I keep anticipating a completion of the trilogy with “George, Uranus”), although she had already shown a gift for satire in the now classic story, “The Novella Race” (where writing takes on the aspects of an Olympic sport). But she deserves better recognition as the writer of cautionary tales (the true forte of the science fiction author). “The Summer’s Dust” explores a possible side effect of immortality–the effect on what few children might exist in such a world where no one needs any longer to live on through their progeny–while “Fears” rivals the best stories of James Tiptree, Jr. in its description of a world that follows years after the ability for parents to make a sexual selection for their child. Two stories here are related to her novels. “The Sleeping Serpent” anticipates her novel of an alternate world where the Mongol horde continued its conquests, even unto the New World. “Dream of Venus” is an ancilliary tale to her Venus trilogy, a special treat for those who had to wait those long years between the second and third books. While I didn’t care for the title story (told from the point of view of a cat, which just didn’t sit well with me, especially in comparison to any of the other narrators in this book), one of the newest stories here, “Common Mind,” is one of the best I’ve read on the idea of group consciousness, a theme not often explored in SF. My favorite parts of this collection are the afterwords to each story, and the publisher, a small press in Atlanta named Meisha Merlin, is to be commended not only for the quality of the book’s production, but also for allowing these to be after the stories and not insisting that they be introductions to them. You get a rare glimpse into the creation of stories in these small bits, which as afterwords increase your appreciation of what you just read rather than “giving away” the story had they been placed before. It’s a small thing, but so many collections make this mistake that I quit taking this for granted.